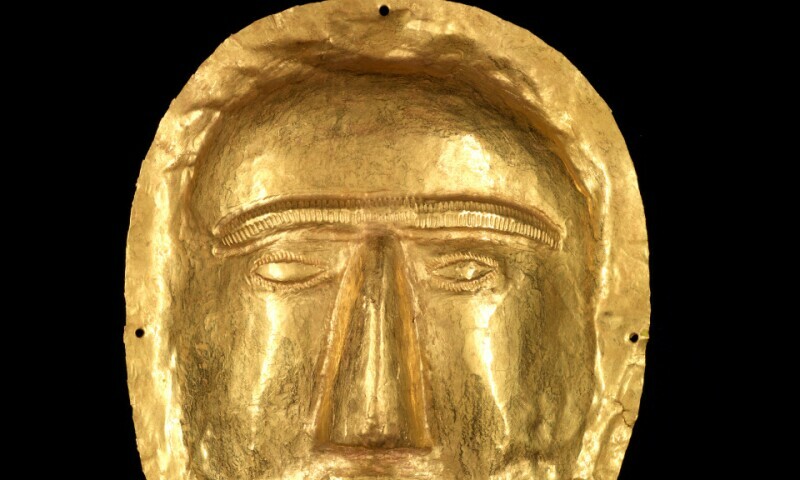 Burial mask, 1-100 CE., Saudi Arabia, Eastern Province, Thaj, Tell al-Zayer. Gold. Riyadh, National Museum. Roads of Arabia: Archaeological Treasures of Saudi Arabia is a major Saudi international exhibition that has shared the cultural heritage of the Kingdom and the Arabian Peninsula to more than five million visitors from all over the world. The exhibition has been shown in renowned museums across European, American and Asian cities, serving as a valuable medium to present the civilizations of Saudi Arabia and the Arabian Peninsula, as well as their rich cultural heritage and cultural and historical elements extending through the ages. Saudi Renaissance period, stopping at the Stone Age, the Ubaid civilization (5thmillennium BC), the Delmon era, followed by the early Arabian dynasties and the medieval and late Arabian kingdoms, on through and the Prophetic era, the Umayyad and Abbasid dynasties and medieval and late Islamic ages, leading up to the unification of Saudi Arabia, and the subsequent development and prosperity witnessed in all areas of life, especially in the service of the Two Holy Mosques.